This family owned winery has a colorful history. Charles Bacigalupi grew up in Santa Rosa, California, where his father ran the local market named after the family - Bacigalupi Market. In 1952, after a stint in the service and schooling to become a dentist, he married Helen Long in 1952 and settled in Healdsburg. They purchased the Goddard Ranch, 121 acres on Westside Road in 1956. The land was planted primarily with prunes, cherries and apples, with a few acres of Golden Chaslis, Mission and Zinfandel grapes. Through his dental practice, Charles got to know a local grape grower, Paul Heck. Paul and his brother Adolf along with Carl Wente had acquired Korbel Champagne Cellars in Guerneville. Charles was interested in expanding his vineyard plantings and Paul advised him to plant Pinot Noir and Chardonnay. Paul had a special fondness for Pinot Noir and had named his favorite horse, Pinot. Another patient, Bob Sission, who was the farm adviser for University of California Davis, agreed with Heck's recommendation. In 1964, Charles obtained Pinot Noir and Chardonnay budwood from Karl Wente which had come from France and was planted in a vineyard in Livermore, California. This early planting of Pinot Noir is one of the first in the Russian River Valley. Today, the Goddard Ranch has 120 vineyard acres and is the oldest ranch that the Bacigalupis farm. This vineyard contains the Chardonnay planted to an old Wente clone that was the main source for the legendary 1973 Chateau Montelena Chardonnay that won the 1976 Paris Tasting. Other properties include Bloom Ranch (80 acres of Chardonnay acquired in 1973), Frost Ranch (60 acres bought by the Bacigalupi Family in 1990 and the source of the John Tyler Zinfandel and Pinot Noir), and the Alexander Valley Ranch (15 acres purchased in 1983 and planted to Petite Sirah and Zinfandel). John Bacigalupi was raised on the Goddard Ranch and has a lifetime of grape growing experience. He has teamed with fourth-generation winemaker Tyler Heck to found John Tyler Wines. Tyler's education includes studies in enology and viticulture and Ag business at both Fresno State University and Cal Poly San Luis Obispo. He has worked at several California and Australian wineries. Pam Heck Bacigalupi is a nurse who assists with the management of Bacigalupi Vineyards and John Tyler Wines. Katherine Bacigalupi was born and raised on the same ranch purchased by her grandparents and has a degree in Agricultural Business from Cal Poly San Luis Obispo. She assists in accounting and sales of the John Tyler brand. Twin sister Nicole has a business degree from San Diego State and is actively involved in winery sales and marketing as well as daily winery and vineyard activity. The Bacigalupi twins were instrumental in the building of a tasting room on Westside Rd to showcase John Tyler Wines and are the new face of the family business. 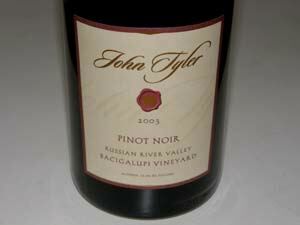 John Tyler Wines offers Pinot Noir and Zinfandel. 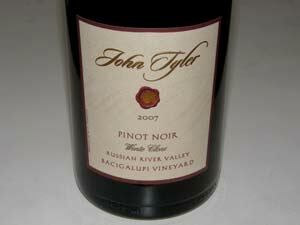 The John Tyler Bacigalupi Vineyard Pinot Noir has been produced since 2002, with a Bacigalupi Vineyard Wente Clone Pinot Noir and Bacigalupi Vineyard Pommard Clone Pinot Noir offered in 2007. The wines are sold through a mailing list and at the tasting room. Bacigalupi Pinot Noir grapes are sold to long time buyers such as neighbors Arista Winery and Williams Selyem. The John Tyler Wines tasting room opened in 2011 and is located at 4353 Westside Rd in Healdsburg (between Twomey and Williams Selyem) and is open daily from 10:30 to 5:00 PM. Private vineyard tours and vertical wine tasting are hosted by the Bacigalupi family by appointment Friday through Sunday (707-473-0115).